Auchtavan can be visited on foot at any time of year.It is free to visit the Auchtavan settlement at all times. The Horsemill is always open and houses an interpretation board. You can access the hingin lum and Queen Mother’s cottage on special open days throughout the year from noon until 3 pm. Bring a picnic and savour this unique place. If you need more information, please contact info@braemarcastle.co.uk or 013397 41219. 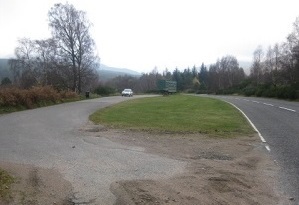 Auchtavan is situated a 5.5 km (3.4 mile) walk off the A93 Aberdeen-Braemar road, starting 10 km (7 miles) to the east of Braemar / 4 km (2.5 miles) west of Crathie at the Aberarder junction. 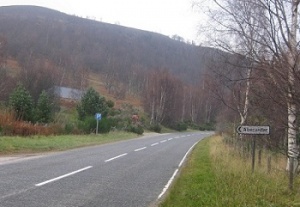 To get to Auchtavan, take the turn-off to Aberarder and follow the route marked on the map. If coming by car, please park in the lay-by on the A93 opposite the turn-off. There is limited car-parking at the Aberarder road end which reduces the walk to 4km (2.5 miles). The walking distance from the A93 is 5.5km (3.4 miles) and we advise leaving a morning or an afternoon free to complete the visit in a comfortable time and to fully enjoy the wonderful views of Deeside and the Cairngorms. 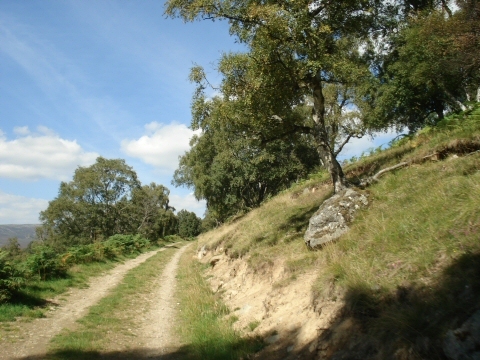 The track passes through birch woods and open moorland and can be exposed to the weather so good walking shoes and outdoor clothing are essential. An accurate map is also recommended. The route passes through working farmland and there are a number of gates which must be left as you find them to prevent sheep straying. Auchtavan is located within the Invercauld Estate. This is a working Highland sporting estate with regular game hunting between August and February and breeding throughout the year. Please stick to the paths and look out for and respect notices during the hunting season. Please park in the lay-by on the A93 Aberdeen to Braemar road near the Aberarder turn-off. 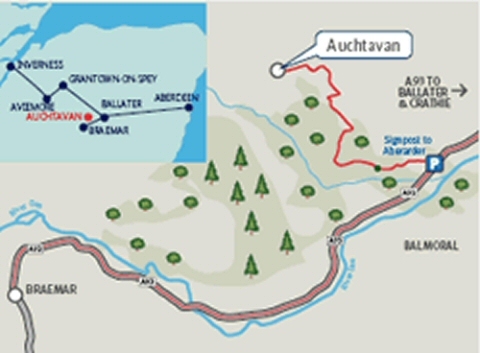 Auchtavan is then a 5.5km (3.4 mile) walk; turn off the A93 at the Aberarder turn and follow the route on the map marked on the map.